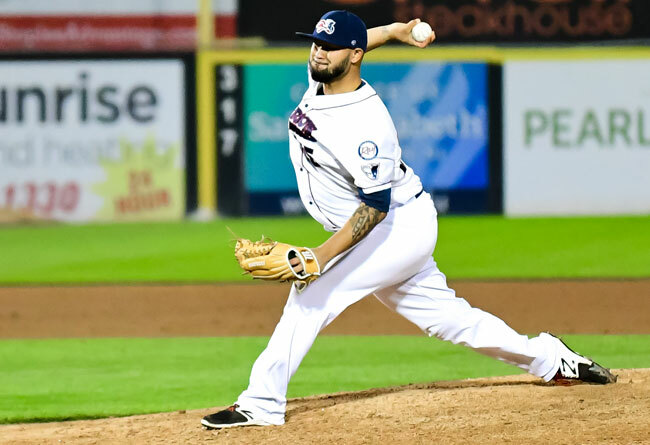 (Bridgewater, N.J., April 6, 2018) - The Somerset Patriots have re-signed Major League right-handed pitcher Dustin Antolin for the 2018 season. Antolin enters his second season with the Somerset Patriots and second in the Atlantic League. The 6’2” righty carried a 2.07 ERA with four saves over 21 relief appearances with the Patriots last year after joining the team in mid-July. Additionally, he struck out 29 batters against just three walks over 21.2 innings of work. That included a 14-game stretch to begin his Somerset tenure over which Antolin to did not allow an earned run (15 IP). The Hawaii native shined a year before joining the Patriots with Triple-A Buffalo (Toronto Blue Jays), where he posted a 2.04 ERA with 10 saves and 61 strikeouts over 53 innings pitched. That earned him a promotion to the big leagues with the Blue Jays in May of 2016. He made one appearance with Toronto, spinning two innings of work. The 11th-round draft pick spent the first nine seasons of his professional career in the Blue Jays organization before he joined the Washington Nationals to begin 2017. He appeared in 24 games (four starts) with Triple-A Syracuse prior to signing with the Patriots in July. Antolin owns a 32-36 record with 22 saves and 462 strikeouts over 668.0 innings in 10 seasons of minor league baseball.